Salads, sandwiches, and, of course, hamburgers feature condiments for flavor and texture. Tuna and chicken cling to onions and celery with the aid of mayonnaise. A teaspoon or so of mustard might add some bite to the salad. And if you’re feeling inventive, you could add a drop or two of hot sauce mixed with ketchup. How are these condiments made, and how do they manage to sit in the refrigerator door for so many months without breaking down into their constituent parts? Chemistry, my dear Ms. Child… chemistry. As you’ll learn from the Chemistry Now video, mustards and ketchups are suspensions in which the vegetative matter, tomatoes and mustard seeds respectively, are mixed in with a bit of water and other liquids to make a flow-able paste. Mayonnaise is a colloidal dispersion in which two materials that don’t normally mix—oil and water—are held together by an emulsifying agent, in this case lecithin found in egg yolks. Throw in some garlic and an herb or two and you have a secret sauce to spice up the menu. We have reached the 11th week of the weekly, online, video series “Chemistry Now,” and the chemistry of the kitchen sticks around as a source of interesting video and lessons. As we’ve written before, please view the video, try the lessons, and let us know what you think. 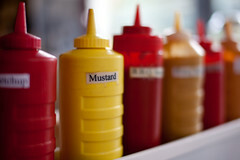 Video: “The Chemistry of Condiments” (one in a 6-part Cheeseburger Chemistry series) uses ketchup, mustard and mayo to explain two different types of mixtures: suspensions and colloidal dispersions (emulsions). Middle school lesson: the Aqueous Systems lesson helps students an understand the properties of different types of aqueous mixtures: solutions, colloids, and suspensions. High school lesson: the Solubility and Bonding lesson describes the relationship between types of bonding, polarity, and solubility. This entry was posted in Videos and Lessons and tagged Colloidal dispersions, condiments, lesson plans, suspensions. Bookmark the permalink. Trackbacks are closed, but you can post a comment.